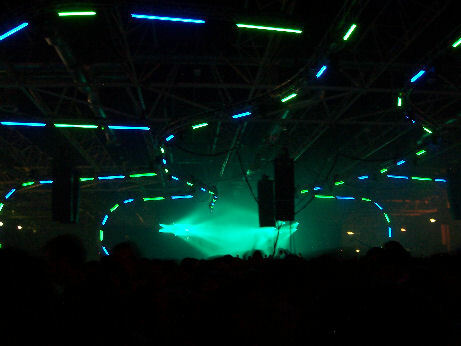 [i:Vibes] Trance Energy 2006 Report! This report is written by Jordi and Dreej. The video's included are in MOV format and can be viewed with QuickTime. The sound isn't all that, so keep your volume down :). A hassle-free entrance with the usual searches and coat-hanging enabled us to start enjoying the party as soon as possible. While it wasn't too crowded at 23:00 yet, we were able to get drinks/food coins in no time and headed straight for the main stage. 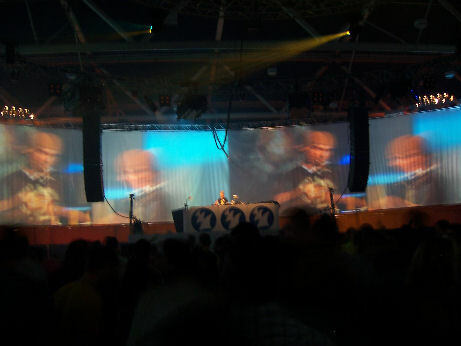 The big difference between the past Trance Energies and this one was that there were two big stages in the main hall, facing eachother at opposite sides. One for the ‘normal’ dj sets and one for the special live performances and an occassional DJ set. On the stage for the DJ sets, there were many aspects like ‘robotic arm’ statues, an impressive array of lasers, many bright lights and even some fireworks now and then. On the other side of the main hall the smaller ‘live set’ stage was less spectacular. 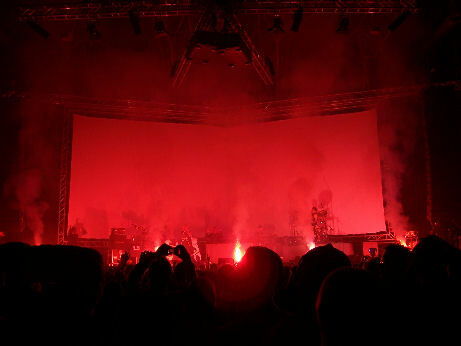 It had a very big screen with visuals projected on it behind the artists and also some fireworks. Some of the live equipment (drums, synths etcetera) was already placed there beforehand, but most of the live artists' gear was installed right before the start of their sets. The sound in the main hall was very nice if you were standing in the middle. However, if you were in the front you could really hear that the bass frequencies were just a little too high. Lots of interesting visuals were projected on the screen behind them, making up a bit for the lack of lights at this smaller stage. 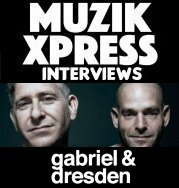 While it was still early on in the night, the two were already banging the floor to pieces with a combination of Mark Norman's own material ('Touchdown', 'Brasilia') and Cor Fijneman productions ('Monologue' and 'Mono Dura' (a collab with Jochen Miller). Here's a quick vid: right click, save as! Meanwhile, Matthew Dekay had started his set at the Armada stage, so we thought it would be a good time to go and check him out for a while. While this area was a lot smaller than the mainstage, it still had a superbly cool vibe hanging over it, mainly caused by the tent-like structure. A massive 360 degrees visuals screen hung around the dancefloor, creating a rather light, but also very coasy, cool effect because of constant projections of the most wicked visuals. Live footage from lots of angles in the DJ booth was shown as well every now and then, which looked quite amazing combined with the slick, rather minimal lighting system. It's kind of hard to describe with words only, so here's a vid that will most probably enlighten you a bit more: Right click, save as! Judging from our timetable, we noticed that Ernesto and Bastian were about to start their live performance, so we hurried back to the mainstage. Ernesto and Bastian began their set with ‘A Few Seconds After Trancefer’ with an opera vocalist, which was not too spectacular. After that tune the crowd seemed to come alive when another singer named Suzanne came on stage to sing their biggest hit till date: 'Dark Side Of The Moon'. Supported by nice fireworks (see the pic below), a drummer and dancers on stage the live aspect was really there, injecting a huge portion of energy onto the dancefloor. (Here's a vid recorded during Dark Side of The Moon: Right click, save as!). The set got closed by one of their top tunes: 'Who’s The Starter'. The crowd loved it, especially when the break was made extra long on purpose and the heavy bassline came in to rock everyone's socks off. Ernesto and Bastian were behaving like real entertainers as they were using the microphone and played with the crowd. After Ernesto vs. Bastian it was Armin van Buuren who continued on the DJ stage. From here on, the full array of lighting really started to do a wonderful job. A huge wall with the robotic arms we spoke about earlier contained lots and lots of spots changing colors constantly, backed by three huge lasers, one being a full-spectrum coloured one. Armin played quite bangin’ tunes like his own 'Control Freak' in the Sander van Doorn remix, his remix of Racoon’s sing-along track 'Love You More' and 'Sail'. Of course, also very fresh tunes were exposed, like Simon Patterson’s smashing new tune ‘F16’ (here's a vid of the breakdown: Right click, save as!) Airbase's amazing new record 'Escape' and Richard Durrand’s ‘Make Me Scream’ (which was played by three or four different DJ's during the night!). 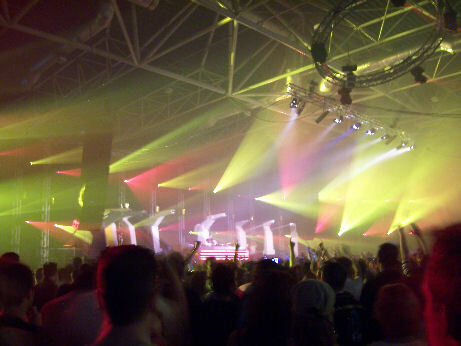 Surpisingly Armin came with some classics near the end of his set. These classics were Armin’s own ‘Communication’ (which seemed like a new mix) and Veracocha’s ‘Carte Blanche’. So it was not really like Armin’s A State Of Trance Shows where he usually starts somewhat slower to build up to some heavier tunes, this set was actually bangin’ from the start and was more mellow in the end. From here on, your reporter duo split up for a while. While Jordi stayed at the Mainstage to check out Johan Gielen plus his live performance, Dreej went to get some food and go see Markus Schulz who was spinning at the Armada area. Just like last year, the same coins were used for both food and beverages. On the menu were about ten different snacks, served in the chill-out area which featured a few bars, tables to sit on and a bunch of market stands. Meanwhile, Johan Gielen just finished his two-track live gig, showcasing 'Show Me What You Got' and one of his new tunes coming out on Black Hole, 'Physical Overdrive'. This time around, there were also guitarplayers involved who did a great job and made the tracks sound a lot more ‘real’. After the liveset Johan was also scheduled for a DJ set. So while Johan had to run to the other side of the main hall it was quiet for like a few minutes before his intro started. 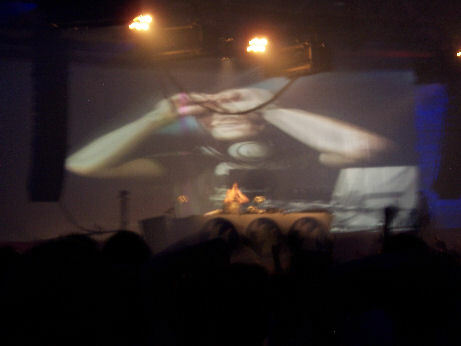 When he arrived in his booth he started with the new Black Hole tune: Midway - 'Cobra' (Outback Remix). The whole set could be described as very energetic with as personal highlights the new tune Substate - 'Horizon' (Mac Zimms Remix) (whát a great energy comes from that record) and Allure's 'The Love We Lost'. Push's liveset was supposed to start on the other stage at 04:15, but was delayed for 20 minutes because of some technical difficulties. Luckily, everything soon worked out the way it should, with M.I.K.E. plus a few of his mates on stage to bring us three classics. 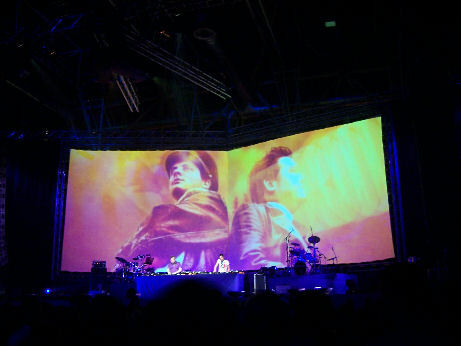 As expected he played his 3 most famous hits: 'The Legacy', 'Strange World' and 'Universal Nation'. Everyone knows these tunes by now, but everything was still quite enjoyable because of the show that was put around it. Fireworks started shooting itself through the hall, which cheered up the crowd even more. However, although the crowd loved it just isn’t really a surprise anymore when Push does a live act. More variation in these sets would be a positive thing! After this, we did a 180 degrees turn once more, because Push was the last act to play on the smaller stage. Marcel Woods appeared on stage to perform his set, starting off with an intro edit of his massive 'Cherry Blossom'. Overall, he played a bangin’ tech-trance set with tunes like Marco V’s ‘False Light’, Tiësto’s ‘Obsession’, a bootleg of U2’s 'Vertigo' and a remix by Stoneface & Terminal for the Ohm Boyz's 'Down Under'. One of the highlights was played near the end of his set: his new track 'Monotone' sounds kind of like the title suggests, but in some way it has the sheer ability to let an unbelievable amount of energy burst out of it. Amazing stuff! There was no moment of peace in his set and the crowd just loved the high energy level. 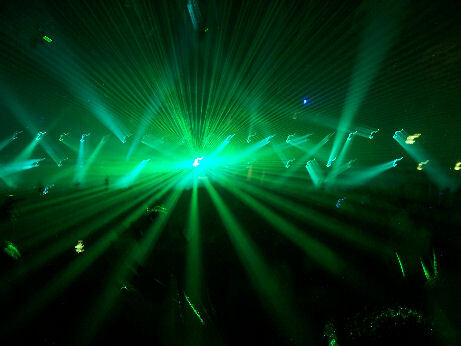 Scot Project was the one to close off this edition of Trance Energy and continued on Marcel Woods’ style with high energetic tech-trance tunes. It actually looked like Scot Project left his own real records home and changed his style a bit. Compared with Scot Project’s normal sets this was just far more trancy which must have disappointed some of his fans who were there. It would have been nice if he would have played a few more of his older productions, but well, you can't have everything can you. 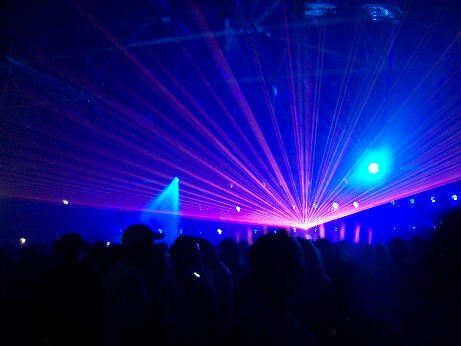 Nonetheless, Scot Project closed with many energetic tech-trance records like a new remix of Tiesto’s ‘Lethal Industry’ and Scot Project’s own ‘L’ in a JK Walker Remix. 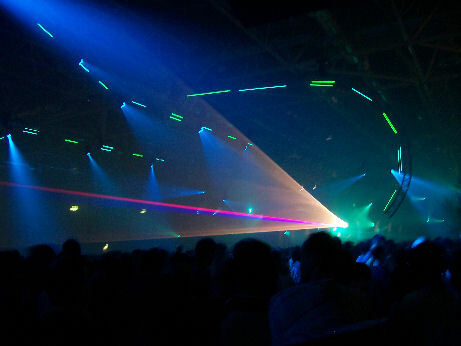 A massive, immensely raw and banging bootleg of a lot of well-known tunes like 'Luvstruck', 'Flight 643' and of course the Trance Energy Theme 'Advanced' made everyone go mental one last time, just until the clock hit seven o'clock and the lights went on. 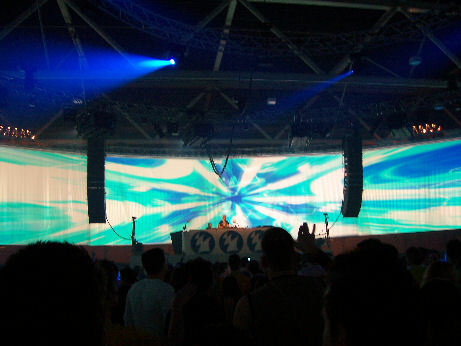 Trance Energy 2006 was a great party once again. ID&T has succeeded in combining an impressive DJ line-up with a well oiled organisation, great lighting (though we would have liked some more lasers) and a very friendly atmosphere. Another plus was that the toilets were free and that the service at the bars was more than acceptable. The thing with the two stages at the main stage might have been handy for the live-acts to set up their gear in between sets, but in our opinion they should have just sticked to one more extended stage with everything on it. All in all, we're already looking forward to next year's edition! 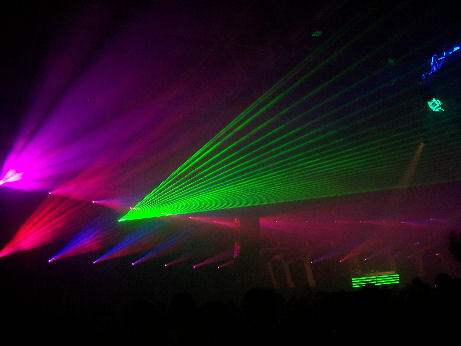 Most of Trance Energy 2006's livesets will be available very soon on dance-tunes.com! Thanks fly out to Laura at ID&T for making things possible!